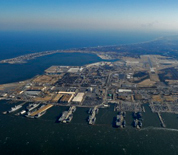 Naval Station Norfolk (NS Norfolk) is located in Norfolk, Virginia and supports naval forces in the Atlantic Ocean, Mediterranean Sea and Indian Ocean. Norfolk is the world's largest naval station with 14 piers and 11 aircraft hangers. There are approximately 75 home-ported ships and 134 aircraft at Norfolk. The base's Air Mobility Command terminal is a popular departure point for Space A Travelers. The NS Norfolk region has over 1.6 million people and serves a very large community of active duty, retirees, family members and dependents, reservists, DoD civilians and Joint Forces. This Naval Station Norfolk directory features the critical info you’ll need to navigate through the many facilities and recreational opportunities available on base.